If you've ever had low back pain, you might have tight quadratus lumborum muscles. These large muscles are on each side of your low back, running from your ribs to your pelvis. Each muscle bends your upper body toward the side they're located on. When they work together, they bend your low back backward. 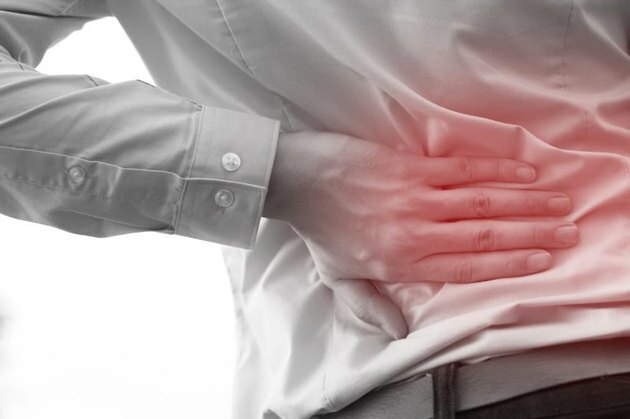 The quadratus lumborum can be stretched in many positions -- standing, sitting and lying down. When stretching in any of these positions, do not stretch to the point of pain. The knee to chest exercise can stretch either one quadratus lumborum muscle at a time or both simultaneously. Lie on your back on a firm surface. Keep one leg straight. Bend the other knee up toward your chest. Wrap your arms around your knee and gently pull it closer to your chest until you feel a strong pull along your low back on the same side. Hold this position for 20 to 30 seconds, then relax. Repeat three times and switch legs. Progress this exercise by pulling both knees in toward your chest at the same time. Child's pose is a yoga exercise that stretches the quadratus lumborum muscles. Kneel on a firm but padded surface or exercise mat. Sit back on your heels. Lean forward and rest your chest on your knees. Tuck your chin down toward your chest. Reach your hands forward over your head. Walk your fingers out in front of you until your elbows are resting on the ground. Hold this stretch for 20 to 30 seconds, then relax. Repeat three times. Use this move to stretch the quadratus lumborum muscles in a seated position, one side at a time. Sit on a firm surface with your legs in a criss-cross position. Sit up as straight as possible. Stretch your right quadratus lumborum by lifting your right arm out to the side, up and over your head, reaching to the left. Reach your left hand across your body to the outside of your right thigh. Slowly lean your upper body to the left until you feel a stretch in your right low back. Hold this position for 20 to 30 seconds and repeat three times. Switch arms to stretch your left quadratus lumborum. The quadratus lumborum muscles can be stretched simultaneously with a standing low back stretch. Stand with your feet approximately three feet apart. Turn your toes out slightly. Keeping your knees straight, bend forward at your hips as far as possible. Slowly allow your low back to bend until you feel a strong but comfortable stretch. Hold for 20 to 30 seconds and repeat three times. To increase the amount of stretch, cross you forearms over each other and dangle your arms over your head while you are bent over. Rotating your pelvis to one side stretches the quadratus lumborum muscle on the opposite side. Lie on your back on a firm surface. Bend your knees and put your feet flat on the floor. Rest your arms next to your sides. Keeping your shoulder blades on the ground, squeeze your knees together and slowly lower them to the left side until you feel a stretch in the right side of your low back. Hold this position for 20 to 30 seconds, then bring your knees back up to the starting position. Repeat three times, then switch sides to stretch your left quadratus lumborum.